The Eli Howard Surf Camp is for boys and girls ages six and up who are ready to gain ocean confidence and enjoy the coolest beach adventure while really learning to surf! The camp is all-inclusive, providing five days of non-stop surfing and ocean awareness. Your child will have the opportunity to choose from a variety of brand new soft surfboards and full length wetsuits. Enrolling your child in the camp will give them a safe non-competitive learning environment. All instructors are trained in CPR and First Aid to ensure safety. In addition, all head instructors are American Red Cross certified Lifeguards and EMTs! As always, we offer are our famous teaching ratios of 3:1, which put us on the map many years ago! With ratios this small, each student can work with an instructors at their ability, with beginners and younger surfers starting in the areas of water where they can stand up. Then as they progress, and once they're ready, they can move further out with the next instructor. 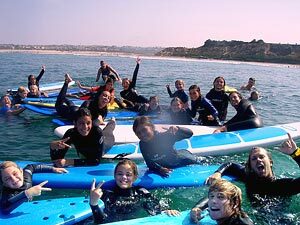 The camp covers a multitude of topics, everything from how to carry your surfboard down to the beach, tie a leash, build ocean confidence with bodysurfing sessions, to more advanced topics like surf etiquette and progressive surfing. At the end of the week, your child will be able to catch waves on their own, having progressed each day, learning ocean safety and awareness. Our instructors instill self-confidence and have the patience to work with each child on a individual basis to meet their goals. As with all Eli Howard lessons/camps the surfboard and wetsuit are provided so all students will need to bring is a swimsuit, towel, and sunblock. Daily refreshments are also provided mid session such as gatorade, hot chocolate if appropriate, trail mix, and fresh fruit. 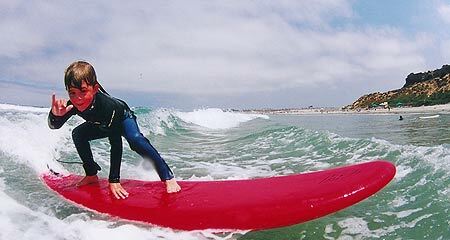 After a great week of surfing students may relax at the beach for a barbeque of burgers, hotdogs, and all the fixins. Surf Camps are held at Moonlight Beach. The Morning Surf Camp requires a $100.00 non-refundable deposit two weeks prior to the start date of the camp and the remaining balance on the first day of camp. We accept checks or cash. (Please make checks payable to: Eli Howard Surf School). Monday, June 03, 2019 to Friday, June 07, 2019 8AM-12PM Moonlight $395 Sold Out! Monday, June 10, 2019 to Friday, June 14, 2019 8AM-12PM Moonlight $395 Sold Out! Monday, June 17, 2019 to Friday, June 21, 2019 8AM-12PM Moonlight $395 Sold Out! Monday, June 24, 2019 to Friday, June 28, 2019 8AM-1215PM Moonlight $395 Sold Out! Monday, July 01, 2019 to Friday, July 05, 2019 8AM-1215PM Moonlight $316 Prorated- No camp on Holiday! Sold Out! Monday, July 08, 2019 to Friday, July 12, 2019 8AM-1215PM Moonlight $395 Sold Out! Monday, July 15, 2019 to Friday, July 19, 2019 8AM-1215PM Moonlight $395 Sold Out! Monday, July 22, 2019 to Friday, July 26, 2019 8AM-1215PM Moonlight $395 Sold Out! Monday, July 29, 2019 to Friday, August 02, 2019 8AM-1215PM Moonlight $395 Sold Out! Monday, August 05, 2019 to Friday, August 09, 2019 8AM-1215PM Moonlight $395 Sold Out! Monday, August 12, 2019 to Friday, August 16, 2019 8AM-12PM Moonlight $395 Sold Out! Monday, August 19, 2019 to Friday, August 23, 2019 8AM-12PM Moonlight $395 Sold Out! Didn't find the date you are looking for? 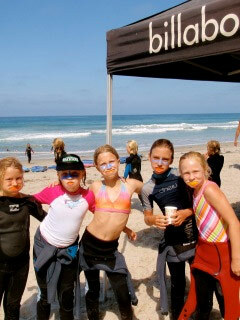 Check out the afternoon surf camp page for additional dates!